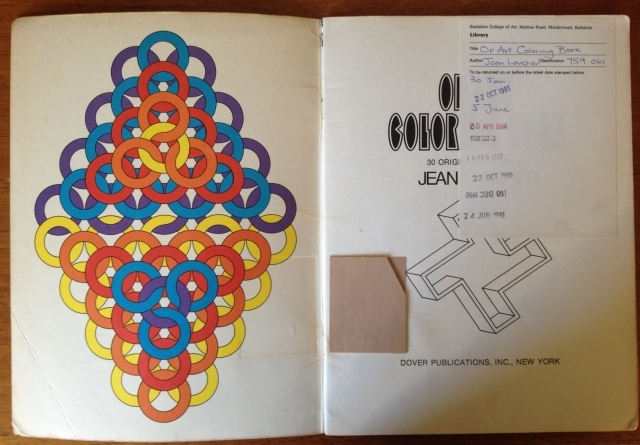 It's a 1975 colouring book - for adults! I thought the grown-up colouring book was a very new trend - but it seems they've been around for decades. 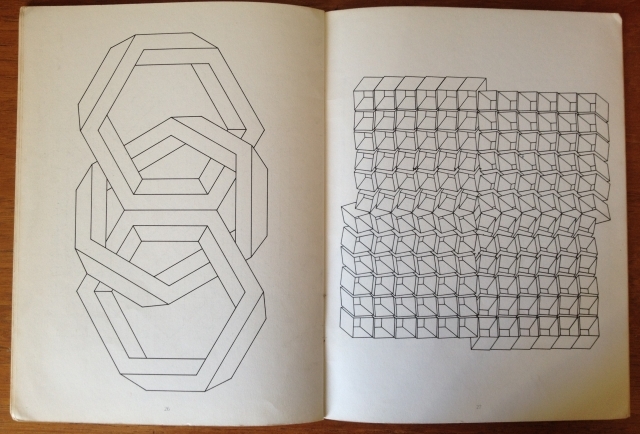 This 40-year-old colouring book was clearly way ahead of its time but I don't think it caught-on back in the 70's as there is not one single picture coloured in by hand in the whole book (the patterns with colour are 'suggestions' only) - despite being checked out of the Berkshire College of Art library a few times in the 1980's and early 1990's. Jean Larcher, a French graphic designer with a special interest in optical phenomena designed this series of images to "give your imagination full play". As abstract patterns and shapes are free from any traditional colour associations (unlike objects in nature) there's a sense of 'anything goes' with colouring these designs. That may well be so, but I don't think I have the heart to actually colour it in either. It's survived this long intact it almost seems a shame to deface it with my scribbles! Oh, you genius! You're right. That suits my pocket nicely :) Thanks! GASP. This is beautiful. No, seriously! 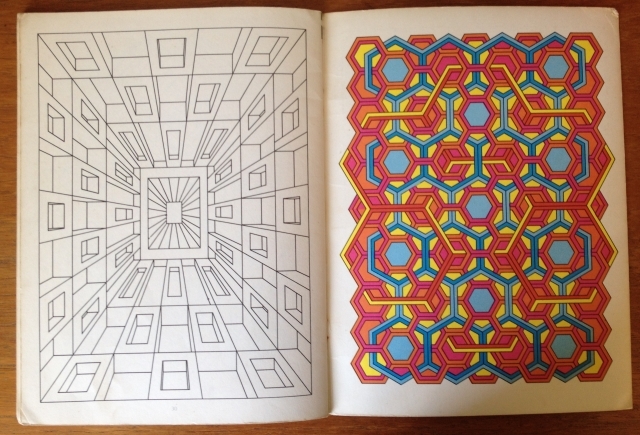 I've found a lot of the adult colouring books can be a bit ... gaudy. But this. THOSE LINES. That's actual art! I'd colour that any day! p.s. 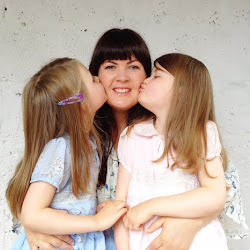 You could photocopy the pages and then colour them to your hearts content? 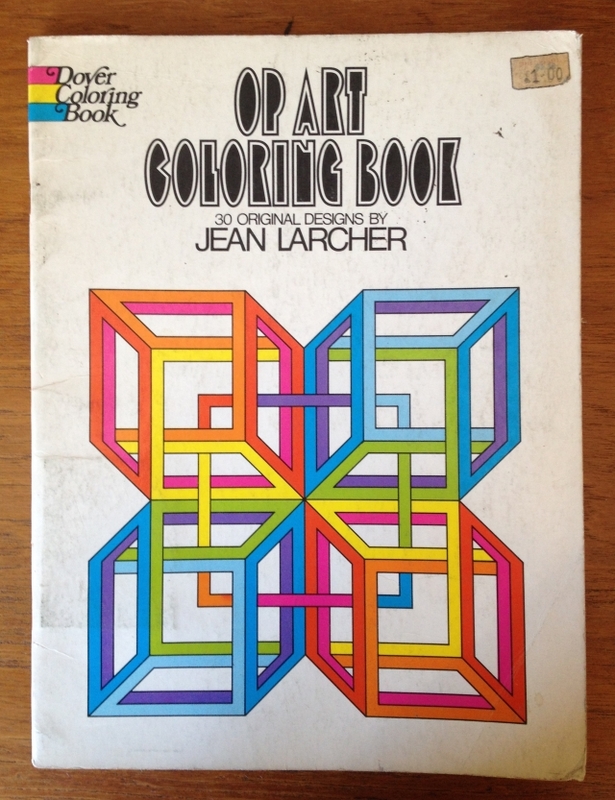 I too would be afraid to *actually* colour that book. Photocopying is a great solution - HOW did I not think of that? !